T.L. 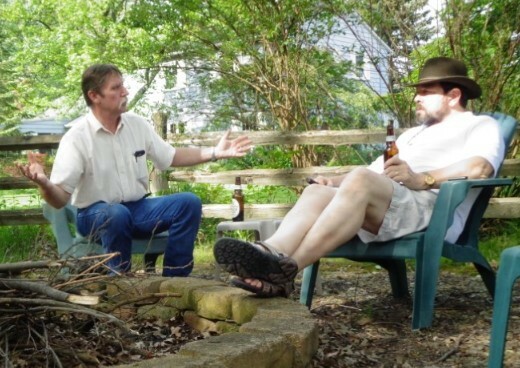 Davis (L) shares ideas (and some beer) around my fire pit. "David - I'm in the locale. Would you like me to stop by with a rough cut of the film?" T.L. Davis emailed me yesterday afternoon. He was passing through Ohio on his way westward after wrapping up some last-minute items with Gun Owners of America's Larry Pratt in Virginia. Larry is one of the interview subjects featured in the 12 Rounds Production documentary "Lies of Omission," a film intended to broach and explore what the media and political establishment suppress and pass on to Millenials "unique perspectives on American Freedom ... and ... demonstrate the value of America and what is worth saving." T.L. was on a tight schedule to make the film's pre-release work-in-progress screening Saturday in Cañon City, Colorado. I texted him a directions link and he got to my place around 5:00 p.m. He took a few more establishment shots for possible inclusion in the final cut and we loaded his disc in the DVD player. I gotta say, although you can dismiss my opinion as subjective if you like (because it kind of is), I really enjoyed it, and not just because I'm in it. Also part of the documentary are former SEAL and "bleeding edge" novelist Matt Bracken of Enemies Foreign and Domestic trilogy fame, "freedomista" author Claire Wolfe, liberty writer Kit Perez of the Patrick Henry Society, Order of the White Rose and Liberty Nation, and my departed friend and colleague, citizen journalist Mike Vanderboegh. The film was moderated and directed by T.L. 's daughter Sammi Lee Davis, a recent film school graduate and budding professional. The intent is to pass on a liberty message to people of her generation, and as such, she was the catalyst for ensuing conversations. It's also evident that it's a labor of love, and a testament of the type of bond a father can have with his daughter. Naturally, with the people involved, the discussion heavily involved Second Amendment principles, but in the context of being a means of protecting all freedoms. There's also history, personal anecdotes, philsophical discussions, the importance of the Constitution, the unfolding totalitarian threats the target audience will face. And what you'll get are real responses from the interviewees. No one was given questions in advance. We had all been filmed separately over the course of many months as T.L. and Sammi Lee traveled to where we each live - they'd actually visited with Vanderboegh in Alabama almost a year before they made it up north to see me. T.L.tells me they have much more footage of Mike that can be part of a separate project - hours of conversation with the guy that won't fit into the current documentary, but will certainly be a legacy resource I'm expecting to hear more about. As an aside, having Mike in my living room on the big screen almost made me forget he's gone, and made watching all the more poignant when the reality of his passing would creep in unbidden and inescapable. With the documentary watched and discussed (it turns out most of my suggestions had already been incorporated in a later edit), we went to dinner at a local restaurant and then came back to enjoy the first fire of the season in my backyard fire pit. We were joined by my oldest son, 26, his girlfriend, 23, and my youngest son, 22. They're exactly the audience T.L. finds critical for passing the film's messages on to, and among the age group most heavily influenced by ANTIFA subversion. They and T.L. hit it right off and were engaged and interested, and he told me later how much he enjoyed the almost nonstop exchange of agreeable ideas about freedom and perspectives on the conditions we face. I also got a call from Armed American Radio host and friend Mark Walters, and that gave me a chance to introduce him to T.L. over the phone. The conversation and the fire lasted 'til 1:00 a.m., at which point I put T.L. up in the guest room and set the coffeemaker up for morning. He rousted me four hours later so we could say goodbye and he could get back on the road to make the screening in time. As I said earlier, I'm biased, but I factor that in to my endorsement of this project and how much I enjoyed seeing the near-finished product. There are some trailers that have been released that will give you a taste of what T.L.and Sammi have created, but just a taste. After seeing the rough cut, I want more and can't wait to see the final.